Happy 2019! Thanks to all of our clients for helping to make 2018 a stellar year. 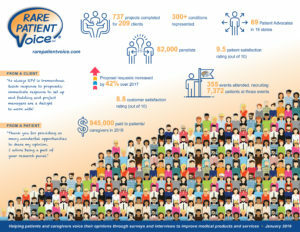 We have grown significantly this year and wanted to share some of our milestones. We have added thousands of new patients to the Rare Patient Voice panel this year by attending hundreds of events across the country. We have increased our project management and patient advocacy teams which means we can do even more for you and your clients. We launched our new database this year which will allow patients to easily update their profiles which means we will be able to target our recruiting with even greater accuracy. 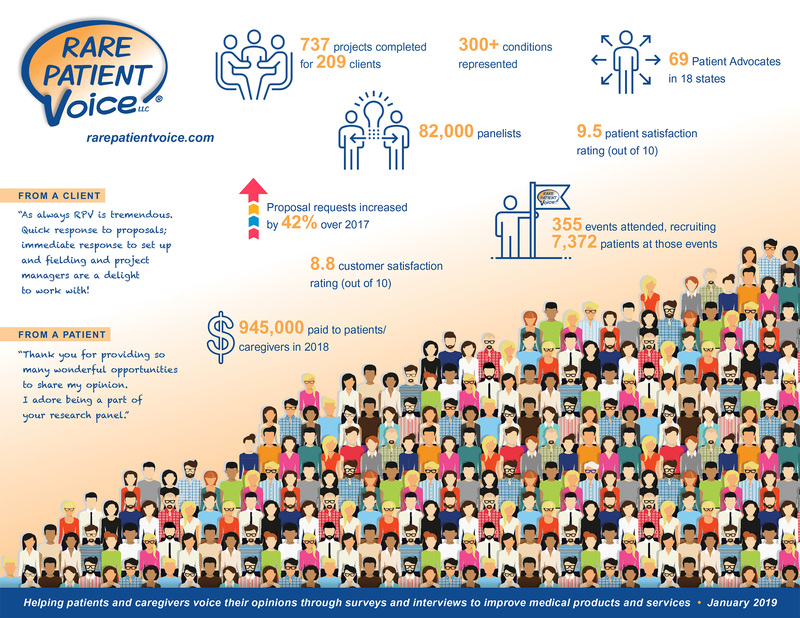 We also paid patients over $900,000 dollars in 2018! It has been a good year. These surveys help so much financially. I can’t thank you enough for sending them my way. It was really nice to describe my thoughts to someone who really listened and was interested. I like the opportunity to share information about my son’s disorder so that it may be used to help other families. I shared these quotes because it is easy to get lost in the numbers and forget that these are real people with complex medical conditions. I am glad that we are helping them in a small way! Have a fantastic 2019!